The Bistro Express Station enables quality food to be available at any time of the day or night. Available as a standalone food vending machine for takeaway service or as a station with housing unit to accommodate a microwave to oven enable hot meals. 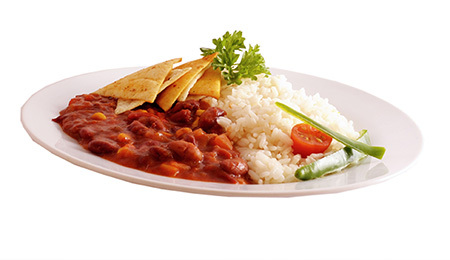 It offers a range of 12 different ambient microwave meals, with a shelf-life of 9 months with no reduction in quality. No added artificial preservatives, colours of flavours. The machine holds 84 meals, spork sets, with additional space for flapjacks, croissants, cake slices or any additional items for extra choice and revenue. The Bistro with housing has sufficient space to store condiments, remove packaging and a bin to dispose of waste. The station is accessible to wheelchair users as it meet guideline height requirements for accessibility. A major benefit of the bistro express menu is they offer gluten free, nut free, dairy free, vegetarian and seafood free options. This is fantastic news for the ever- increasing demand in catering for allergens and the suitability of the bistro express meals readily lends themselves to the NHS CQUINN guidelines for 24/7- 365 days of the year provision in staff catering. 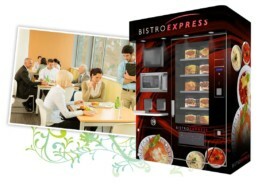 With a breakeven target of just 3 meals a day (at a vend price of £3.00) the Bistro vendor provides for a very cost-effective vending food service.